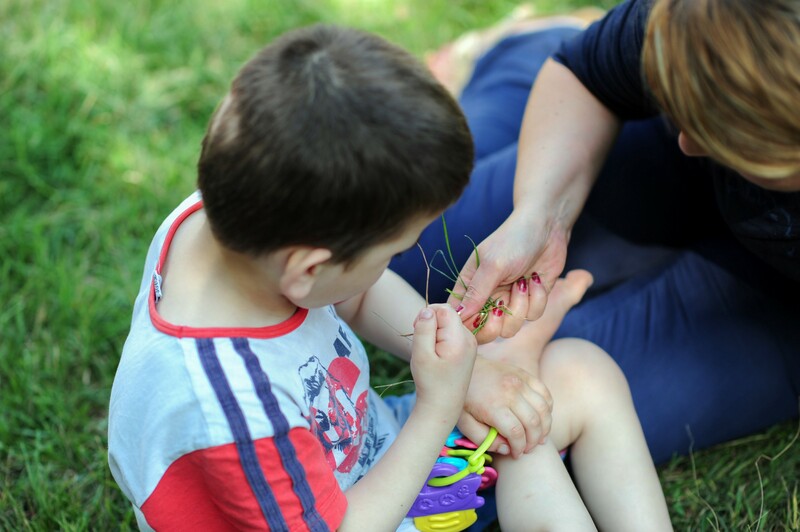 For any child, and especially for children with disabilities, the one-on-one relationship between the child and an adult in a family environment is crucial for their development and to fulfil their potential. When placed in an institution, not only does the child fail to develop, irreversible damage is done causing additional impairments. A mild intellectual disability more often accelerates when there is a lack of love and emotional stimulation. A mild physical disability often develops into atrophy, if the child is bed ridden and lacks physical stimulation. A recent Ministry of Labour and Social Policy commitment has put a stop to all new admissions of children in state run care institutions like the Special Institution Demir Kapija. With support of partners such as the European Union, the initiative puts forward a radical transformation plan to ensure children, currently in state care, are raised in a close to family environment. To help this transition, a UNICEF supported expert in Intensive Interaction therapy is supporting a team of professionals to ensure the short time spent in state care is dignified and to prepare children for a life they deserve in a loving family. 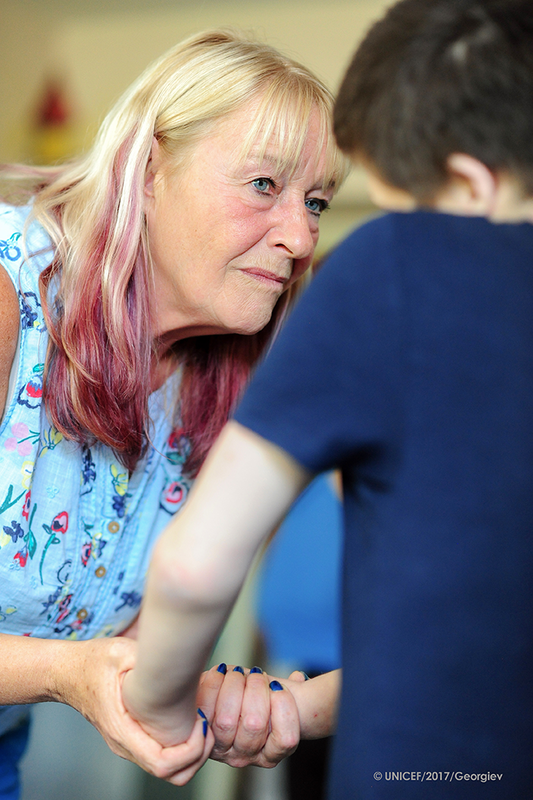 Intensive interaction therapy is very simple, yet it gives immediate results. It develops the fundamental of communication such as listening, paying attention, vocalization, facial expression, taking turns in exchange of communication and eye contact. According to UNICEF supported expert “Good interaction looks like a dance”. 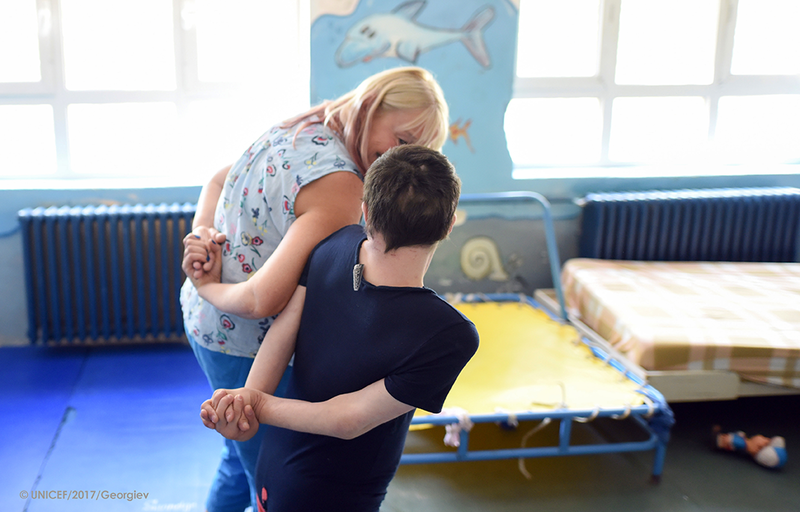 UNICEF supported therapist and trainer in Intensive Interaction, Cath Irvine and a child in the Special Institution Demir Kapija interact through dance-like body movements. The purpose of Intensive Interaction with children with disabilities is to “wake them up”. Instead of treating children as a medical problem with no potential for development, Intensive Interaction reveals their potential and opens up their personality. UNICEF supported therapist and trainer in Intensive Interaction making an effort to establish eye contact with a child in the Special Institution Demir Kapija. Like with a house, the Intensive Interaction approach starts by building the foundation, which is — to show love and acceptance. A child placed in the Special Institution Demir Kapija plays with UNICEF supported therapist and trainer in Intensive Interaction. Children grow and learn through human attention. The very first aim of Intensive Interaction is to make children happier and expose them to positive human experience. UNICEF supported psychologist in the Special Institution Demir Kapija makes a connection with a child by mirroring the movements and face expressions of the child. Intensive interaction provides environment for children to learn new things through play and warm, human interaction. It is essential for the educator to communicate in a language child can understand. 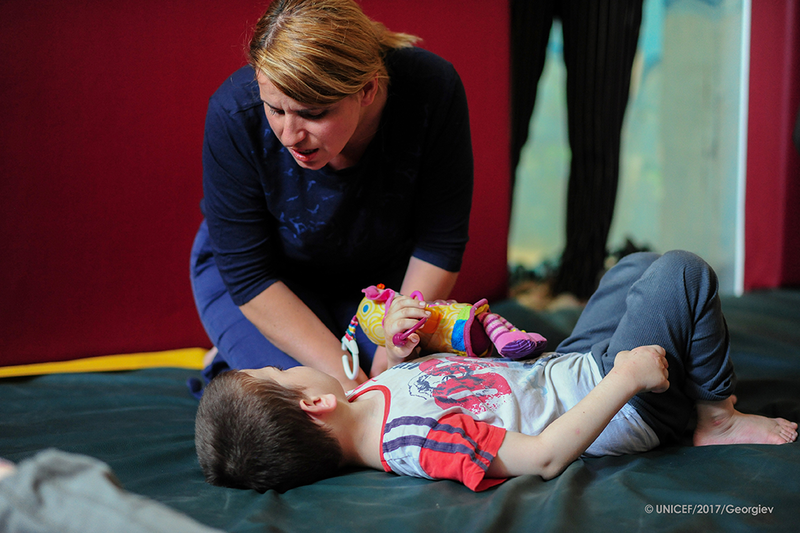 A UNICEF supported psychotherapist in the Special Institution Demir Kapija makes a connection with a blind child through vocalisation. When feeling happier children will move more, will show curiosity, and will learn how to independently do things such as eating and drinking but also exploring the environment. A child explores the outside world together with UNICEF supported psychotherapist in the back yard of the institution. Everything changes for a child with a good warm relationship. A child wakes up and blossoms. After a day spent in communication and play with children in the Special Institution Demir Kapija, UNICEF supported therapist and trainer in Intensive Interaction, gains a child’s trust and affection.